The manufacturing engineering technology program at Northern Illinois University (NIU) has joined forces with a young violinist to innovate an exciting development in the fields of music, 3D printing, and prosthetics: a 3D printed prosthetic hand made of lightweight nylon and plastic, which grants the wearer an increased range of motion while playing. Teenager Sarah Valentiner, a one-handed violinist from the US, had been playing the instrument for two years but remained unsatisfied with the splint she used to hold the bow. Not allowing an adequate range of motion, Valentiner’s splint was more of an impairment to the musician than an effective tool for her craft. Enter e-Nable, a world-wide network of volunteer designers who share resources for 3D printing prosthetic hands. Valentiner’s parents eventually discovered the organization, which then put the family in touch with NIU’s College of Engineering and Engineering Technology. The university program, whose motto encourages “bridging theory with practice,” was particularly suitable for Valentiner’s needs, as it encourages a more specialized, personal approach to problem solving. Valentiner was subsequently paired up with 21-year-old NIU student Oluseun Taiwo by mentor and Associate Professor of Mechanical Engineering Federico Sciammarella. Taiwo and Valentiner started work this summer, spending three months engineering a better long-term plan for Valentiner’s playing. Together, they designed an ultra-lightweight prosthetic hand, 3D printed from nylon and plastic materials—a vast improvement from Valentiner’s splint. Both the violinist and engineering student are pleased with the results. 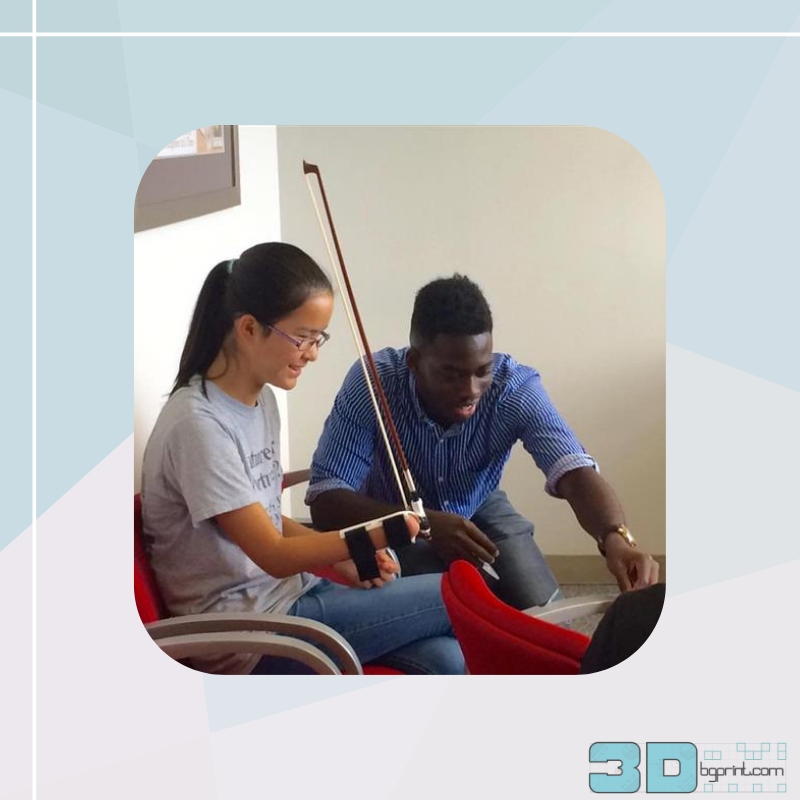 Through their experience working together, the pair also identified new possibilities for 3D printing as a social justice resource—one that could provide support for the disability community and other marginalized groups. Taiwo now plans to start his own large-scale 3D printing company geared toward projects such as prosthetics and the housing crisis, both in the US and developing countries.